Recently on tour in the UK, in support of his new album 'Of Men And Angels', Alter The Press! managed to catch up with Bryce Avary (aka The Rocket Summer) before his headline set on the Relentless Stage, at the 2010 Slam Dunk Festival; in Hatfield, England. Bryce spoke to ATP about the new album, and the success/difficulties of it's release; label problems, touring with The Goo Goo Dolls and more. Alter The Press: How is it, being back in the UK? 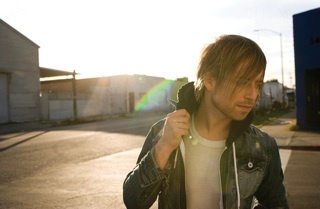 Bryce Avary: I love it man. It's been way too long! We miss our UK fans a lot; we played London last night and it was such a beautiful gig. The night before was Birmingham, then Manchester. We've had this string of shows here that have been unbelievably amazing. ATP: You were affected by the volcanic ash fiasco, weren't you? Bryce: It was a bummer. We were getting up to leave, and it said that all UK flights were cancelled, it was like: 'you’ve got to be kidding me!' It was hard to get here this time, it seemed like there was a problem around every corner, we've never run into so many problems before, trying to get here. It was weird things, it was like: 'is this tour supposed to happen?' but then the ash went away. ATP: How has the response been to the new album, 'Of Men And Angels'? Bryce: I think it's been good. I haven't seen any negative feedback; it's all been pretty good. It's different to the records before, it's more organic and more emotionally charged compared to stuff I've done in the past. From what I can tell, fans love it, and people who don't like it, I don't know! ATP: The album made it to number one on the iTunes chart. What was your reaction to this? Bryce: It was crazy; it was really beautiful as well. It was a long time coming getting this record out, it took forever; it was sitting on a shelf for like a year. When it came out, and debuted so high on the charts, it was surprising because it was a fairly quiet release. Bryce: Yes, it's a joke to be honest. Over here is way different. In the US, there was a slight push; but here, it's like I don't know if it did or did not come out. ATP: I don't even know who released your album here. Bryce: I don't know who our label is in the UK either, not to be negative or anything. They are doing nothing for us here, so let’s see what happens. ATP: How would you compare the new album to 'Do You Feel'? Bryce: A bit more organic sounding; I went into it with more integrity, not that it wasn't in the past. With 'Do You Feel,' we chopped a lot of it up, spent hours and hours doing guitar parts until it sounded perfect. This one was more band sounding; we didn't chop any of the drums, or barely any. That's something that's on every record now; I mean, like Green Day to Jimmy Eat World. I wanted it to be more real. I wanted to make a record that meant a lot to me and I wanted this to be the album that effected people most. I wasn't really looking into shiny pop hits with this one; I wanted to make sure that didn't happen. It's such a lottery with songs, like what will get played on the radio. I didn't want to think about that. I wanted to make a record that changes somebody's life. ATP: Why were you sitting on this album for so long? Bryce: Label stuff, a lot of weird stuff. Basically, 2008-9 was a hard year for a lot of people. A lot of people lost their jobs, and it really affected the music industry. I'll be honest, I had five A&R guys, and that's unheard of! Somebody would get fired, then hired etc. Every time that would happen, it would be a thirty-day waiting period for The Rocket Summer's next A&R guy. Long story short, the album was made and finished in two months, and it came out an entire year later. That's why it took so long. I'm already in a new place. It's funny because I'm doing all these interviews now, because this album is "new," and we still have a long way to go on it, which is crazy, I think about it every day. Normally, at this point in the game, I would be gearing up to make new record, but I am starting this one. I guess the good thing about this is that, I won't have any issues like this again; and hopefully, when this album cycle has run its course, I can immediately jump into making a new record. That's what I'm hoping; this is the good I'm seeing out of all of it. Maybe it'll mean a new record comes out a lot sooner. ATP: You toured recently with The Goo Goo Dolls. How did this happen? Bryce: We just submitted our name to the tour, and they really liked us. It was a really amazing thing for us, because we were playing for thousands of people each night, and it was a much different scene. It was much older, and I don't mean thirty, I mean like my parents age. It was kind of bizarre to play venues where people were sitting down, which was interesting. It was crazy, because when we finished the shows, we would win over the crowd. I felt like we gained an incredible amount of fans from that tour. We love doing the Slam Dunk and the Warped Tour thing, but I never set out to just make music for teenagers. I couldn't be more thankful for the fact that we actually have fans, and such a loyal fan base. It's really cool though, to now branch out a little bit. ATP: Are people surprised when they find out you've been performing for thirteen years, and have seven releases under your belt? Bryce: That might be a little much. I put out my first record when I was sixteen, and I'm twenty-seven now. I would say it's ten years! I put out four full-lengths, but those EPs are just songs from other albums. It's weird though, for me to live through it, because everyday I'm like this brand new guy for some people. I've been doing this longer than most bands. We've had the opportunity to take out a lot of bands on tour, like Paramore, who supported me for months. We've seen bands explode, where I've just been there, doing my thing. I feel like I haven't had my shot, and I do want it. I would be a liar if I didn't want it. Not even so much for me to have just ‘made it,’ or whatever, but purely for the fact that it would make touring a lot easier! Like, I want everyone who works for me to be comfortable, that's what I yearn for. ATP: Does it ever get to you, that you've taken these bands on tour with you, who have then blown up, and you're still in the same position? Bryce: Of course. I could lie, but I do feel that way. Sometimes it can be aggravating, but the music business is not like any other business, where it's based on how hard you work and how much you do to make your way up; I would be the biggest rock star in the world! I'm just thankful to do this. Bryce: We're flying home, then the next day shooting a video for 'Walls'. We have a week or two off; we've been on the road since February, so we need a break. We'll be on the Warped Tour this entire summer, and I don't know after that. ATP: Will you be coming back to the UK? Bryce: I'd love to. It's so hard to know. If it was up to me, I'd come back several times a year, but unfortunately it depends on how you can make it work. We have amazing fans here so, God willing, we'll be back soon. I promised in 2009 that we'd be back, and then the record didn't come out, so I'm scared to promise anything! You just have to come see us when you can see us. 'Of Men And Angels' is out now via Def Jam/Island Records.